Greetings from the woods of Stanwood Washington where I am teaching in the remote paradise known as the Pilchuck Glass School. 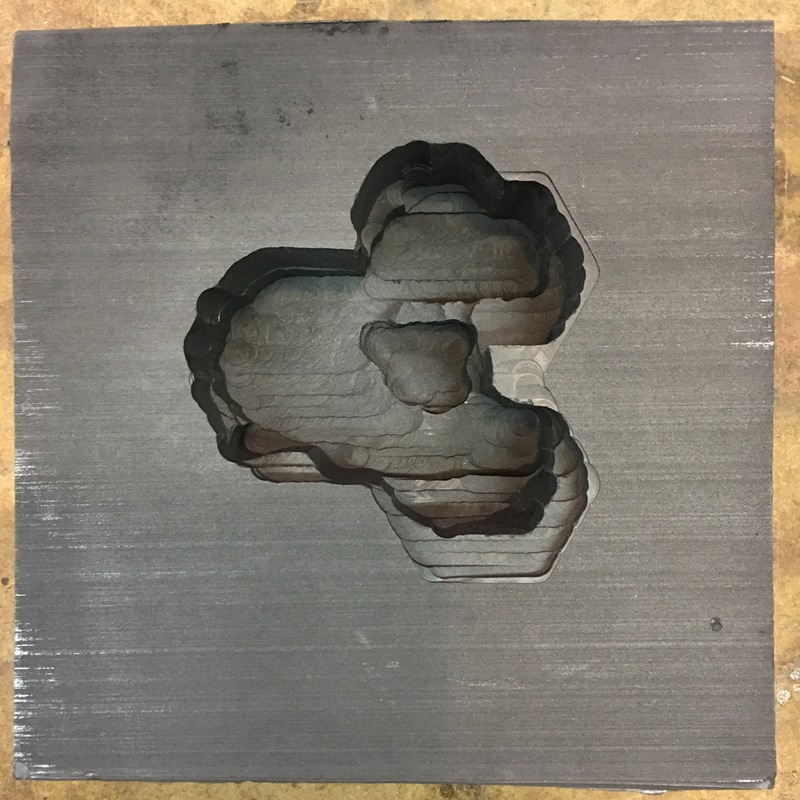 Session 2’s theme is Play and our class has been playing with methods of creating glass castings from digitally generated sculptures. 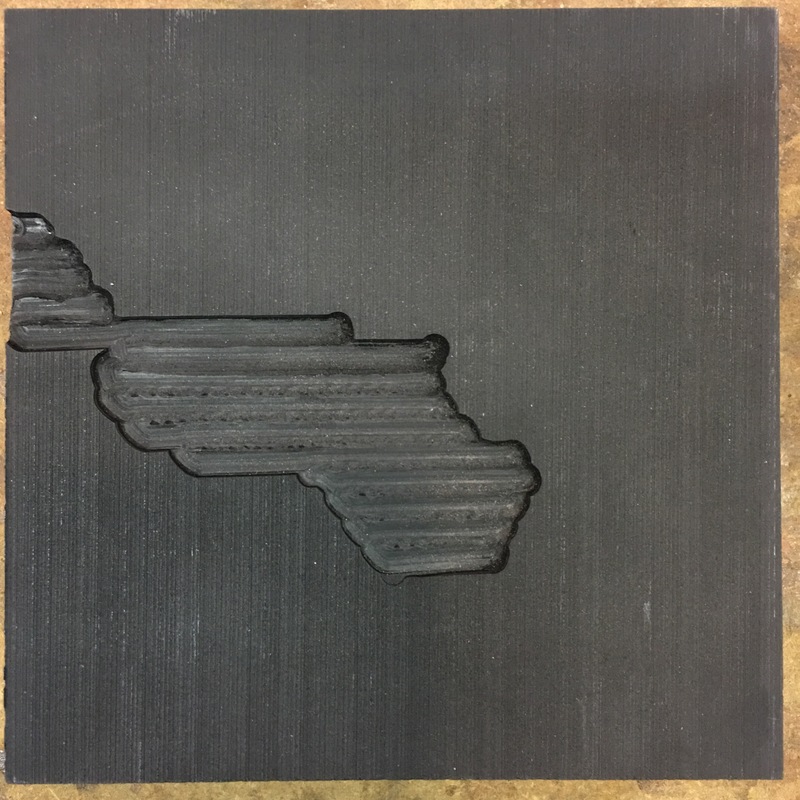 As part of the class we are CNC carving graphite molds so I brought a bunch of graphite that I bought on eBay. 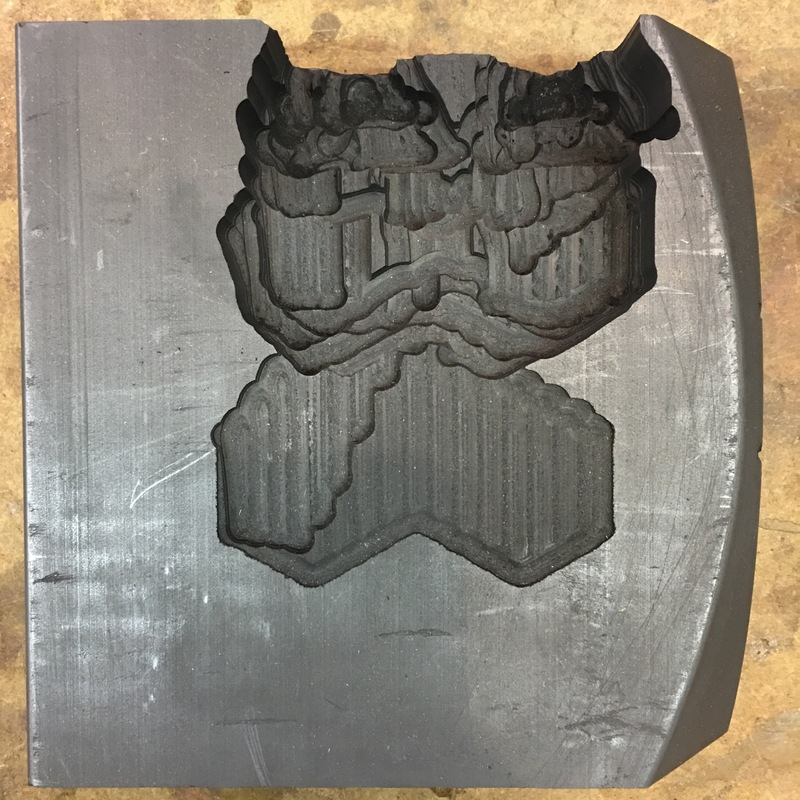 I had previously carved blocks that I had bought from this guy with no problems so I was bamboozled when I started to have carving issues with my molds here. 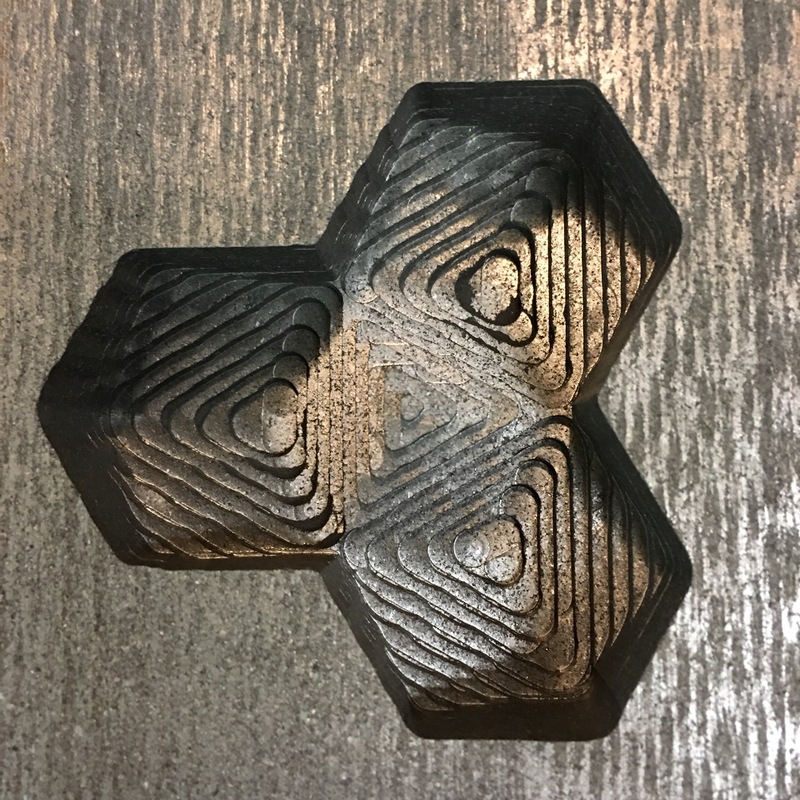 I spent the better part of the last two days wrestling with the XCarve, thinking the axis slipping was mechanical. Then I realized the carbide bit was totally shot and realized the problem. 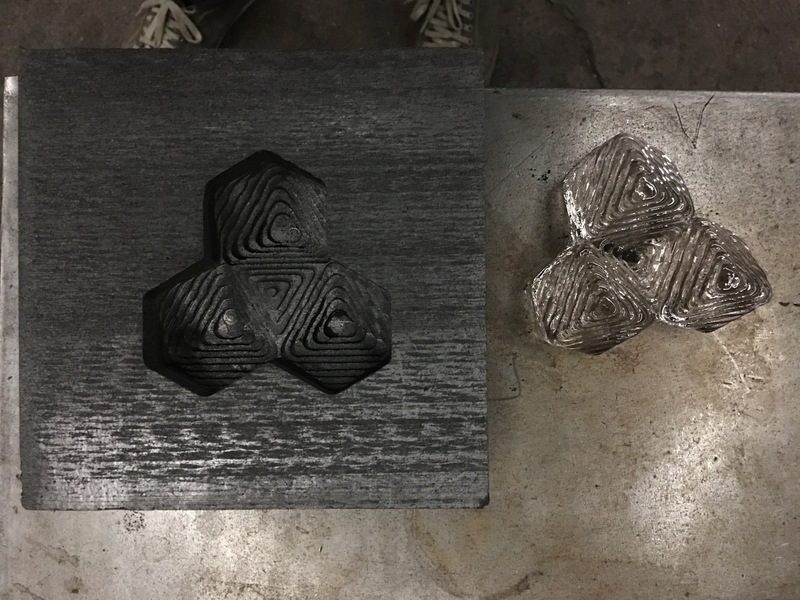 The CNC is finally back to carving the other/ softer graphite like it was butter. I finally carved this mold I’ve been trying to make, but only did the rough pass. I think I like the terraced stepping… What do you think!? In the meantime, please enjoy my latest work with graphite glitches…. Come Learn 3D Modeling, Scanning, Printing & Glass Casting with me at Pilchuck in June! There’s only a few weeks until my class TaDDDaa!, which covers a range of digital processes for glass casting at the Pilchuck Glass School in Stanwood Washington and there’s still a couple slots available! Session 2 runs May 30-June 17. 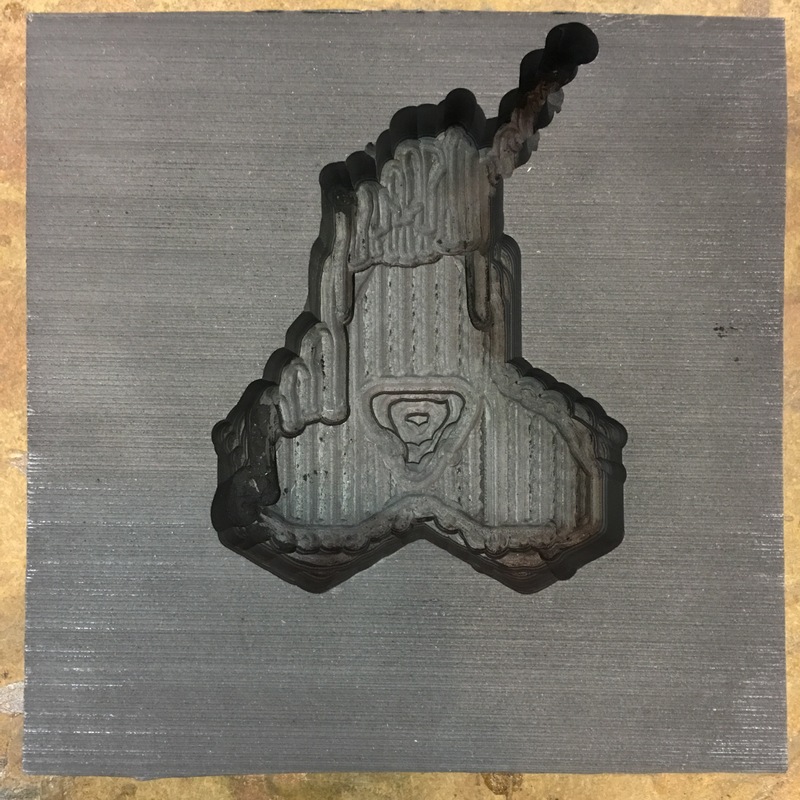 The course will combine a 3D modeling, scanning and 3D printing/CNC routing track with a physical track for glass casting with lost PLA kiln casting and hot casting into CNC carved graphite molds. Apply today and join me in the woods for the time of your life! 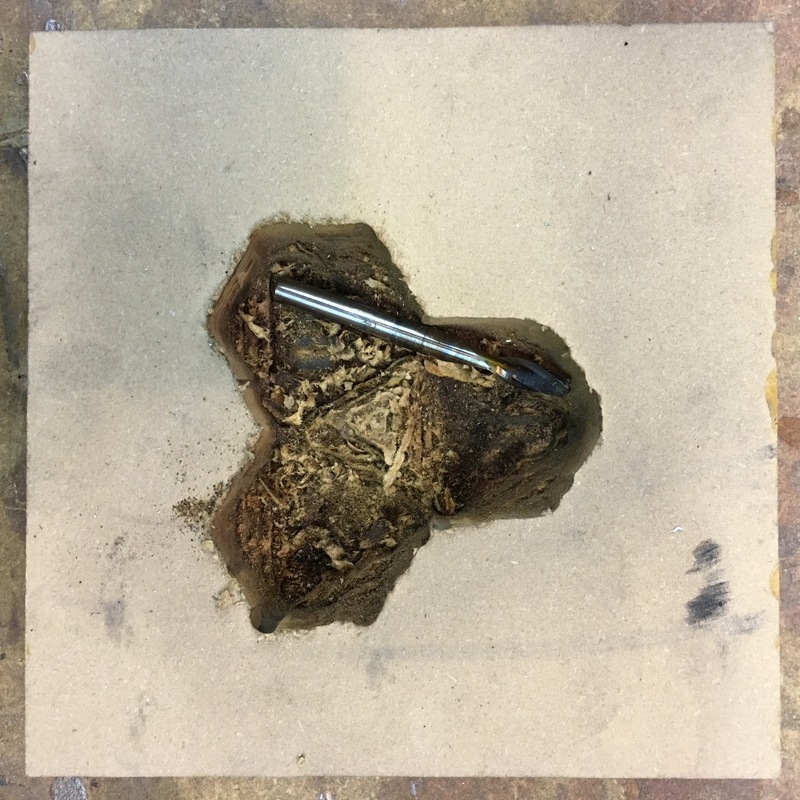 This sequence shows the progression of a 3D scan being manipulated digitally, the 3D printed sculpture, and its final incarnation as a cast glass object. 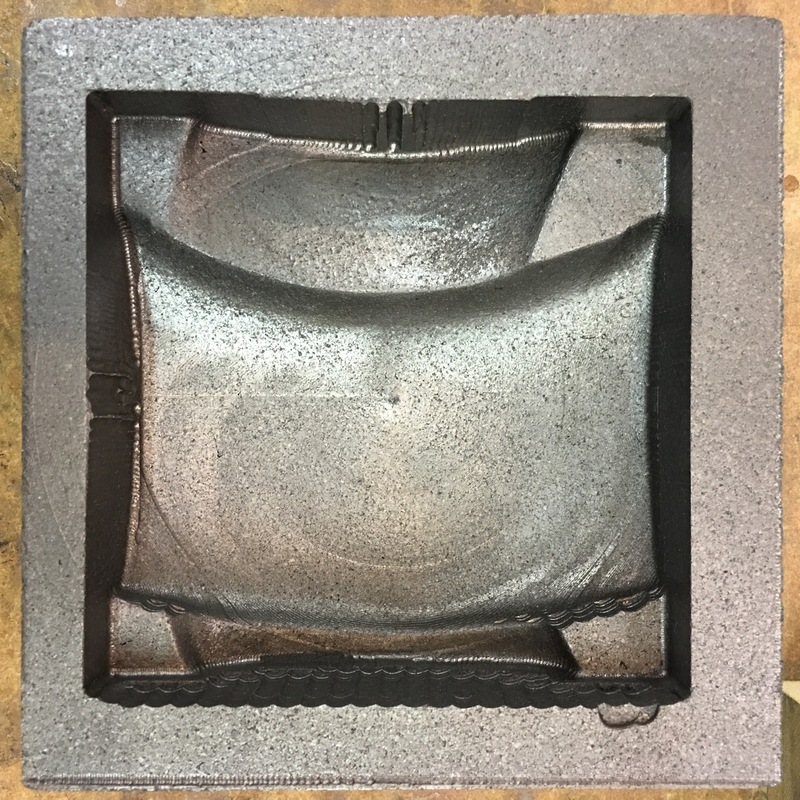 This sequence shows a CNC routed mold that can be used for hot glass casting. I’m please to announce that I will be teaching a class at the Pilchuck Glass School in June of 2016. The class will cover a lot of the digital to physical techniques that I have been working with over the last few years, particularly this past year with my fellowship at Wheaton Arts Creative GLass Center of America (Stay tuned, I will be publishing my finding soon). The intensive 3 week class will take place in June of 2016. 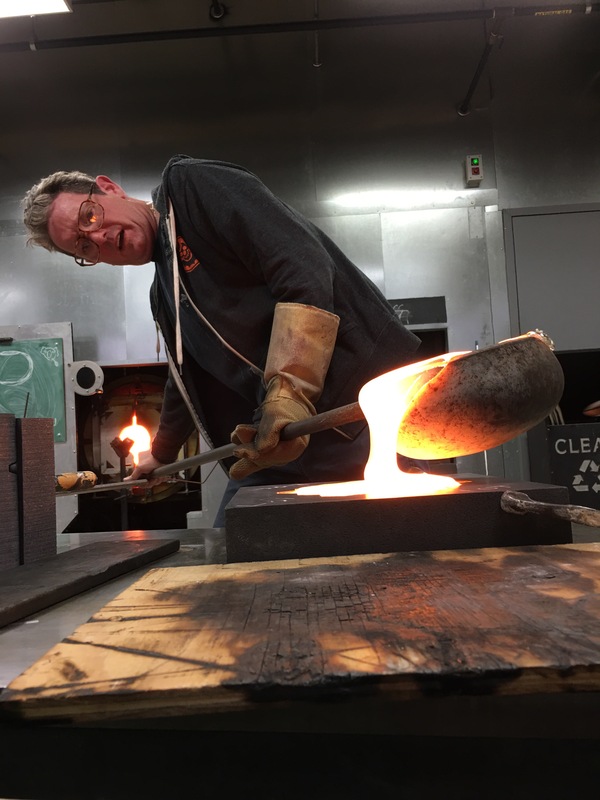 Pilchuck’s session 2 this year has a theme of Play, and we certainly will be playing with ways of bringing the 21st century to glassmaking’s 19th century traditions. 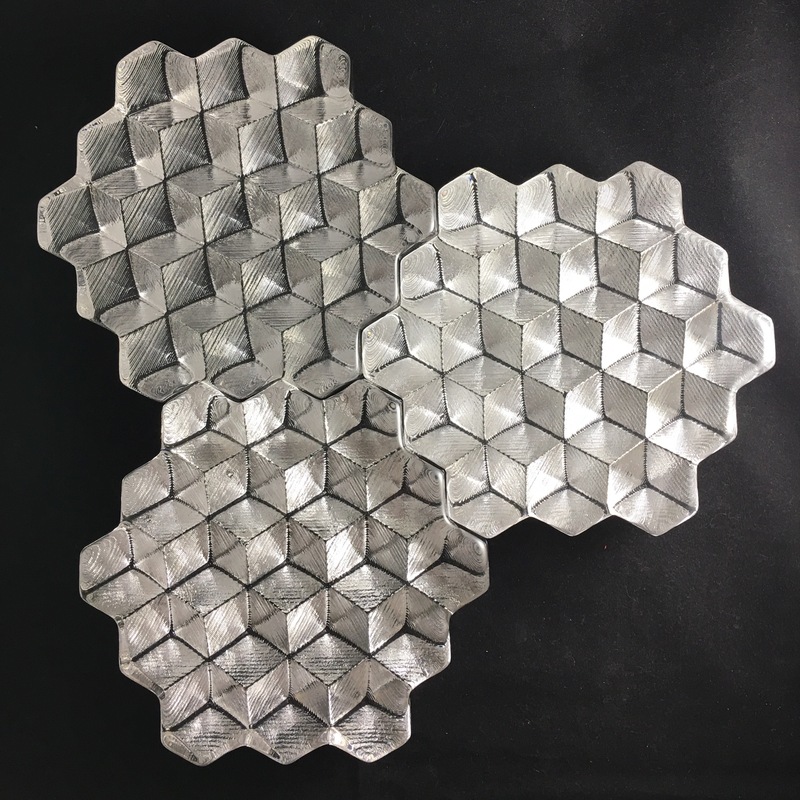 Digital sculpting and 3-D printing tools allow artists to visualize prototypes, manipulate scale, and replicate with precision. This course will introduce an assortment of tools including Zbrush (an organic sculpting software), 3-D printers, and 3-D scanning methods of photogrammetry and structured light. Students will learn to scan, manipulate, and print objects and ultimately kilncast and hot cast them in glass. This class is for glass artists who wish to explore digital fabrication and 3-D artists who wish to explore glass. It’s going to be an awesome class and I’m looking for two teaching assistants. Applications for TA’s are due February 3. 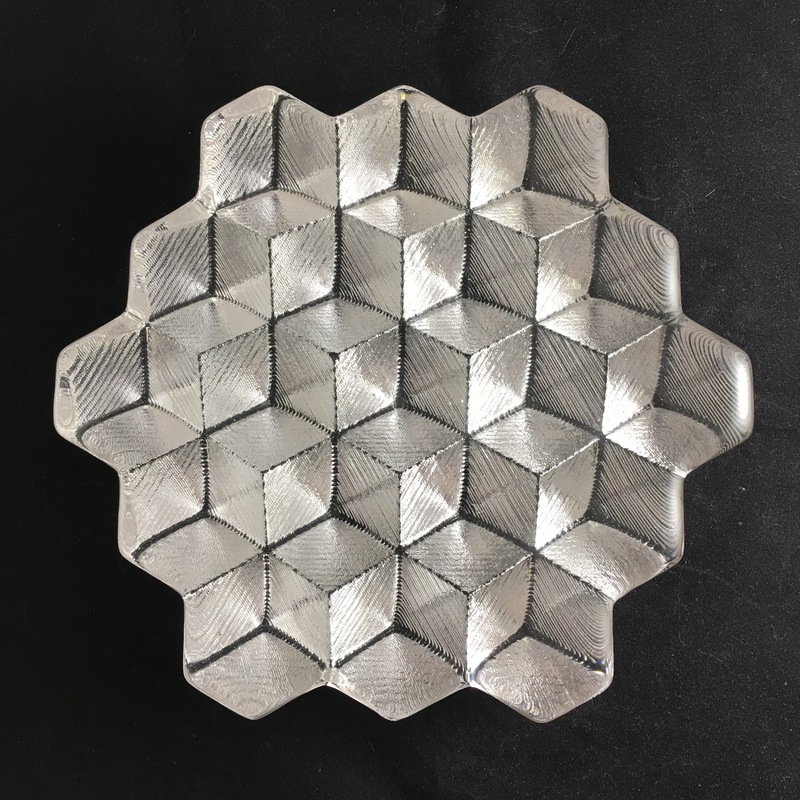 I would like to find one TA who is well versed in 3D modeling and 3D printing (its a + is you own or have built a 3D Printer), and another who is familiar with glass kiln casting. Please help spread the word! I’ve just completed two weeks as a visiing artist at the Pilchuck Glass School in Stanwood, Washington. It’s been 21 years since I have been here and I’m happy to say that Artistic Director Tina Aufiero is doing a great job of pushing the school forward into the 21st century while maintaining the atmosphere of collaboration, comraderie, experimentation and creativity. I was brought out to get the new 3D printing studio space set up in preparation for classes this year, and to plan my 2016 class on using digital processes and 3DP for creation of glass objects. It was an awesome experience and much needed moment of reflection. I was able to generate some work in preparation for the upcoming Wheaton Arts fellowship and even got to dabble in glassmaking while making new friends and reconnecting with old ones. “Creation” 3D Print- a maquette for my Wheaton Project? Picture this 12′ tall! Made on the new Printrbot Bot Farm. Hand with heart being reheated in the glory hole. Goodbye Pilchuck! im excited to teach session 2 , 2016!